iPhone 4S: Upgrade or wait? Apple’s new iPhone 4S doesn't look all that different on the surface from the iPhone 4 it replaces. But the latest iPhone unveiled by Apple at a press event Tuesday promises an improved processor, new wireless system, and more powerful camera, along with voice control capabilities. The iPhone 4S is available in black and white. The 16GB version is $199, a 32GB model is $299, and the 64GB edition is $399—each with a two-year contract. They’ll be available for pre-order on October 7, with the phone shipping a week later on October 14 on AT&T, Verizon, and newcomer Sprint, in the U.S., Canada, Australia, U.K., France, German, and Japan. The iPhone 4S will be available in more than 70 countries by the end of the year, Apple says. The iPhone 4S also sports a new wireless system. Schiller said that the phone can “intelligently switch between two antennas to transmit and receive,” and the technology works even when you’re on a call. The result? Better call quality, and faster download speeds. The iPhone 4S offers 5.8Mbps upload and 14.4Mbps download speeds. Schiller said that competitors describe those speeds as 4G, but that Apple is "not going to get into a debate about what’s 4G and what isn’t." By comparison, the iPhone 4 supports 5.8Mbps upload and 7.2Mbps download speeds. The iPhone 4 is available in GSM and CDMA models. The iPhone 4S comes in a single model that works around the world on both types of networks. The iPhone 4S rear camera sensor offers 60 percent more pixels than iPhone 4 camera sensor. The new sensor is a state-of-the-art CMOS backside illumination sensor, which affords 73 percent more light per pixel, which Schiller says means richer colors and better lowlight performance. 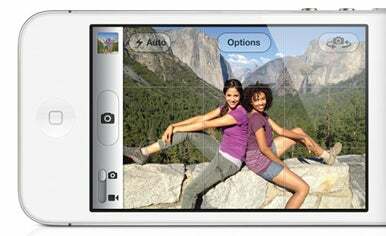 The iPhone 4S also takes pictures 33 percent faster than the iPhone 4. In addition, the iPhone 4S camera sports a Hybrid IR filter on top of the sensor for better color accuracy, which Schiller said is a feature usually associated with DSLR cameras. The optics employ a five-element, Apple-designed lens with an f/2.4 aperture, and is 30 percent sharper, according to Schiller. The iPhone 4S’s A5 chip also includes an Apple-designed image signal processor, which provides advanced face detection with the ability to detect up to ten unique faces in a single photo, for automatic exposure. The iPhone 4S camera also offers 26 percent improved automatic white balance over the iPhone 4 camera. Schiller emphasized the iPhone 4S’s virtual shutter speed. The iPhone 4S can take its first picture in 1.1 seconds, and just half a second longer to take a second picture. He compared the iPhone 4S to the Droid Bionic, which needs 3.7 seconds to take its first photo, and the Samsung Galaxy S II and HTC Sensation, which needs two seconds. The iPhone 4S’s camera also takes high definition 1080p video. The phone’s image signal processor offers real-time video image stabilization, along with temporal noise reduction to improve video quality in real time. But according to Schiller, the “best feature of the iPhone 4S [is] all about our voice. Schiller explained that, for decades, technologists have attempted to get voice control working right, but none have succeeded. The iPhone 4S changes that. 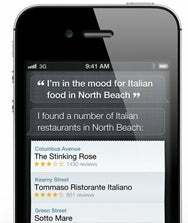 At the press event, Apple’s vice president for iOS software, Scott Forstall, talked about voice control on the iPhone 4S. The feature is called Siri, based on the voice-activated app that Apple bought in 2010. 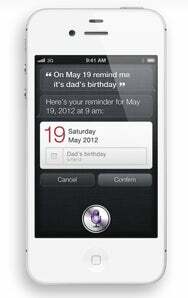 Forstall described it as “your intelligent assistant that helps you get things done just by asking.” Forstall asked the iPhone 4S what the weather is like today, and the phone gets to the meaning behind his words, displaying a weather forecast. He asked, “What time is it in Paris?” and Siri responded with a live clock. “Wake me up at 6 a.m.” instantly set an alarm clock for early tomorrow morning. And Siri doesn’t just listen—it also speaks. You can ask Siri to read messages from the Notification queue to you, hands-free, so that you’re not glancing at your phone when you should be, say, driving a car. You can even use Siri to reply to messages. If need be, you can tell Siri to check your calendar and then schedule a meeting. You can tap and hold Siri’s “i” button to see a list of all the commands it can understand. It can play songs and messages; manage your calendar; schedule reminders; get directions; email people; provide weather and stock updates; set alarms and timers; search your contacts and notes; and search the Web, Wikipedia, and Wolfram Alpha. Even as the iPhone 4S arrives later this month, the iPhone 3GS and iPhone 4 remain available, too. The iPhone 4 is available in an 8GB model for $99. The iPhone 3GS—also 8GB—will be available for free, to customers who agree to a contract with AT&T. Updated 10/4/11 at 12:45 p.m. PT with more specifications. The iPhone 4S arrives October 12. Should you buy it, or wait for the hypothetical iPhone 5 instead?